Salt Lake artist Janell James has been busy this spring. In April she started showing with Coda Gallery in Park City and 15th Street Gallery in Salt Lake (where she’s currently part of a group exhibit), and this month she’s headed to Santa Fe with a 10-foot trailer full of art. She’ll be back in June for the Huntsman Cancer Institute’s Chairs for Charity fundraiser, an event on June 19th that will auction off chairs that have been donated by RC Willey and hand painted by local artists. 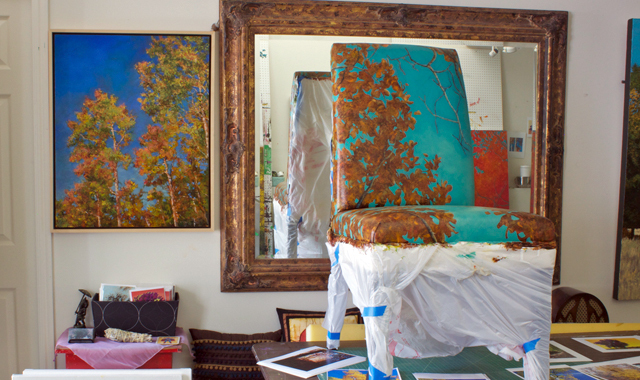 In this month’s photo essay you can peek inside Janell’s studio and get a glimpse of the chair she is working on. See the photo essay in the May 2013 edition of 15 Bytes.